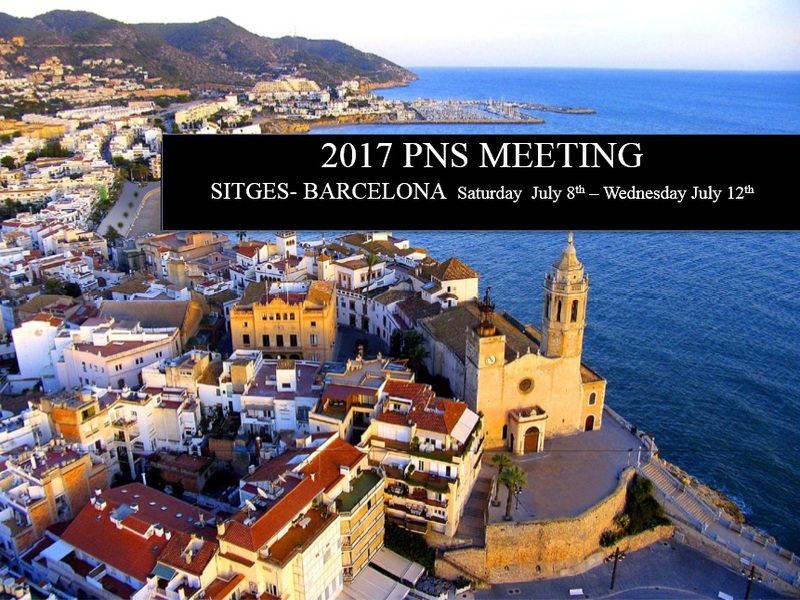 The annual meeting of the international Peripheral Nerve Society 2017 will take place in Sitges (Barcelona), Spain. Online registration to 2017 PNS Meeting are now closed. Onsite registration will be available from afternoon 7 July 2017 at Melià Hotel, venue of the congress. Online Registration will close on 23 June 2017. Later that date, only ONSITE REGISTRATION will be available. Non members have the unique opportunity to join PNS. Pay the annual dues and select the Member registration fee. Registration fees include attendance to the Scientific Sessions, the conference kit, coffee breaks, lunches, Opening Reception (Saturday 8 July), Closing Dinner (Tuesday 11 July)*, certificate of attendance**. *Opening Reception and Closing Dinner will be granted for those participants who will confirm their attendance during online registrations. **Certificate of attendance should be requested at the end of the Meeting. It will be sent by email one week after the Meeting. (required for each guest age 12 and above). It includes full participation in program, all meals and all other meeting activities except scientific sessions. Junior attendees who present abstracts that are selected for Oral Presentation, Oral Poster or Poster Presentation. For participants from USA and Canada and possibly other countries, before you register for the meeting with your University/Institute credit card, please notify your credit card company (VISA or Mastercard only) that you are registering for a meeting in Europe and ask for the relevant authorization. This will prevent any potential problems with registration. Cancellations should be made by sending a written notice to pns2017@theoffice.it or a fax +39.040 368808. Before 10 April, 2017: the registration fee will be reimbursed minus 20% for administrative charges. Time allotted is 10 minutes + 5 minutes for questions. Time allotted is 3 minutes to briefly present the main message of your poster + 2 minutes for questions. The PNS oral poster presentation format to all Oral Poster presenter. Do not use any other format. Do not forget to prepare a regular poster for the poster session for further discussion. Make sure your posters are within the dimensions of 37 inches wide x 43-59 inches high (95 cm wide x 110-150 cm high)–portrait orientation. File name LastnameN.doc or .docx of first author (i.e. John Smith > SmithJ.doc). Presenting authors need not be the first author. If the same author presents more than one abstract LastnameN_2.doc, LastnameN_3.doc etc. Author(s) Arial 11, bold, left margin, Type full names without degrees. Authors to be listed as last name and initials (presenting author underlined). i.e. (1) Smith J, (2) Smith J, (3) Smith J.
i.e. (1) Johns Hopkins University, Baltimore, USA; (2) Institution, Town, Country; (3) Affiliation, Town, Country. The abstract must be in style of JPNS and no longer than 350 words. Should you need to modify your Abstract(s), please write to the Organizing Secretariat abstractpns2017@theoffice.it. DO NOT submit the same work twice. Please note that abstracts will be published only if at least one of the authors has settled the registration fee payment before 28 April 2017. Free Shuttle Bus Service is no longer available. Hotel Booking: opened on December 1, 2016. Please book your accommodations at this link. For requests of groups of 6 or more hotel rooms, please fill out the Group Request Form on the meeting accommodation site.